All Changes — this filter always indicates that a record should be processed. Use it when all changes to records should be archived. Column Expression — with this filter a rich expression based on columns in a record can be used to determine if a record should be archived. Deleted Records — this filter only matches records that have been deleted in Salesforce. This filter is used to build recycle bin type policies. SQL Predicate — this advanced filter supports injecting user specific SQL fragments into a query that determines if a record should be archived. 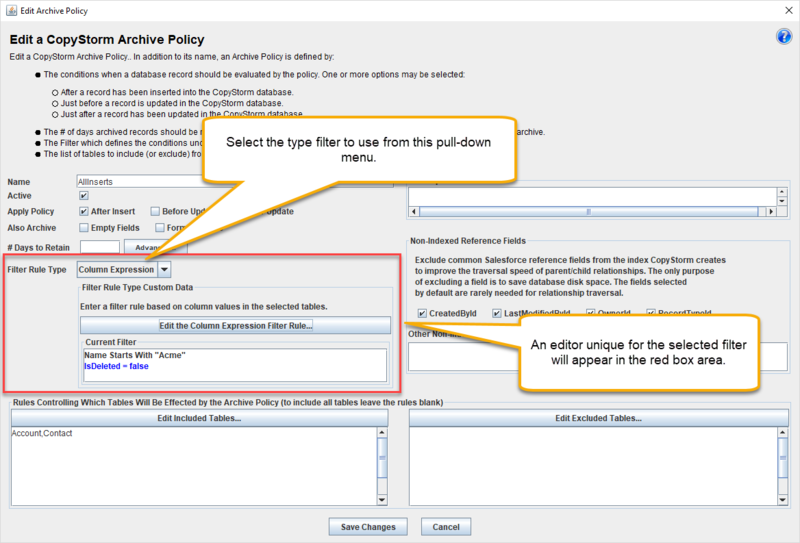 The Filter Rule for an Archive Policy is specified on the main archive editor.